Ichthyosaurs have had a long history in the two centuries after being discovered by Mary Anning and recognised as a new, extinct kind of animal. 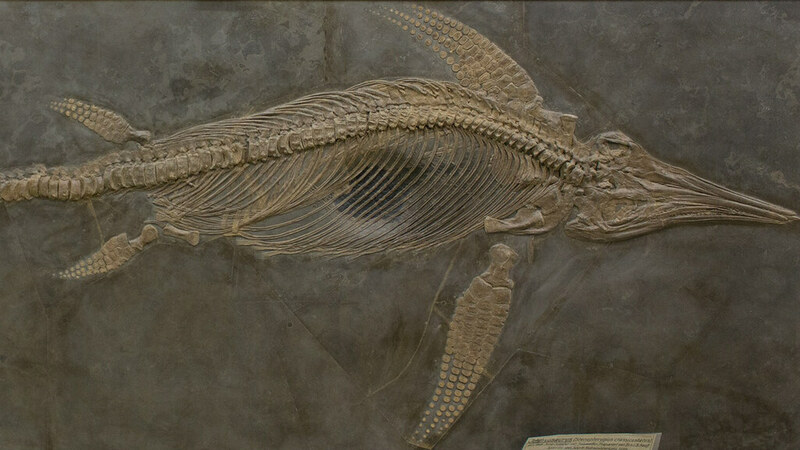 These fish-shaped marine reptiles existed for 160 million years as some of the most diverse and numerous large animals in the Mesozoic oceans. Despite this, there have been large gaps in the study of ichthyosaurs and in our knowledge of ichthyosaur evolution: where did ichthyosaurs originate? how did they become so diverse? what caused their decline and extinction? New interest has begun to fill these gaps, but only with modern analytical techniques that incorporate morphology, ecology, function, and evolutionary trees are we starting to get much a fuller understanding of the hows and whys of ichthyosaur evolution. Here Dr Benjamin Moon will go through this recent shift in our knowledge, how these new techniques are being applied, and where future work could bring new insights to ichthyosaur evolution. Dr Benjamin Moon received his PhD from the University of Bristol and is currently a Postdoctoral Researcher. He appeared in Attenborough and the Sea dragon, using CT scans to reconstruct the skeleton and anatomy of that ichthyosaur. He was also on the Bristol University challenge team in 2012–13. Dr Moon plays tuba in local orchestras and thinks penguins are pretty darn cool.